I realize that most of the country is melting right now, and that everyone is looking for no-bake dinners and salads. But sometimes, in spite of the heat, a girl's gotta have some warm, belly-filling, Italian comfort food, like eggplant parmigiana, or more affectionately, eggplant parm. As far as I'm concerned, eggplant parm is a year-round food, but it's the best from August-October, prime eggplant season. Eggplants have a long history. The earliest ones were grown in India between 4,000-5,000 years ago. Eggplant was introduced to the Mediterranean region in the early Medieval period. That's when Italians discovered eggplant, and they still prize it for its rich, creamy, flavorful flesh. Eggplant parmesan, also known as melanzane alla Parmigiana or Parmigiana di melanzane, is a treasure of Neopolitan cuisine. It consists of thick slices of breaded eggplant that are fried in olive oil until golden then layered with tomato sauce, mozzarella cheese, and basil and baked until bubbly. In the US eggplant parmigiana is most commonly found at pizzerias, delis, and Italian-American mom-and-pop restaurants. It's typically inexpensive, delicious, and satisfying, but not low-cal. So if you love eggplant parm, but don't love the calories that come with it, then make your own baked eggplant parmigiana. As for the hot weather, just crank your AC, then make a big batch of eggplant parm in your comfortably cool kitchen. Traditionally, eggplant is fried in oil on the stove top. However, baking it drastically reduces the calories and fat without sacrificing flavor. Plus you get to eat more. 1. In a small bowl, whisk eggs, crushed red pepper, and salt. Pour into a wide, shallow bowl or plate. 2. Mix breadcrumbs and 1/4 cup grated cheese in a separate wide, shallow bowl or plate. 3. Slice eggplant. Dip one slice at a time in the egg mixture, allowing excess to drip into the bowl. Dredge in the bread crumbs, ensuring that the entire slice of eggplant is coated with the crumbs. Place on a large baking sheet. Repeat with remaining slices. 4. Bake eggplant at 400 degrees F for 15 minutes, or until golden and crisp. 5. While the eggplant is cooking, the marinara sauce can be made. In a medium pot over medium heat, warm 2 teaspoons olive oil. Add shallots and saute 2-3 minutes or until translucent. Add the canned tomatoes, crushed red pepper flakes, and salt. Stir until well combined. Reduce heat to medium-low. Let sauce lightly bubble for 8-10 minutes, or until slightly thickened. Turn off heat. Stir in the fresh herbs. 6. To assemble the eggplant parmigiano, use either one 9-inch round or 8-inch square baking dish. Start by covering the bottom of the dish with a layer of marinara sauce. Add 4 slices of baked eggplant (larger slices on the bottom), and top with 1/3 of the shredded mozzarella and 1/3 of the grated cheese. Repeat two more times, or until all ingredients are used. 7. Bake at 400 degrees F for 25-30 minutes, or until the sauce begins to bubble and the cheese turns golden brown. Allow to cool for 10 minutes before slicing. *San Marzano tomatoes are Italian plum tomatoes that are prized for their sweeter, less acidic flavor. They can be found in Italian specialty markets and some major supermarkets. My all time favorite veggie is eggplants, there is so much you can do with it! another wonderful recipe Susan. I've been grilling eggplant a lot lately, adding it to just about anything I can dream up. While I do love Eggplant Parm, I don't tolerate the cheese well so I look at this recipe longingly, and can only imagine how delicious it is. luv,luv eggplant parm. Actually eggplant is one of my favorite vegetables and believe there is only a handful of veggies I would eat willingly. No AC here, so I'll just have to drool over your lovely eggplant parmesan and bookmark the recipe. oh I love this recipe! surely mine doesn t come so appetizing. But anyways! Nice dish! We just turned our AC on two days ago (we try and hold out as long as possible even in the 90-degrees and humid DC weather) so I think it's eggplant parm time! Although after these pictures (and that melty cheese!! ), I'm pretty sure I'd suffer through an un-airconditioned house for a taste of this dish. That is a thing of beauty. And worth turning on the oven for. 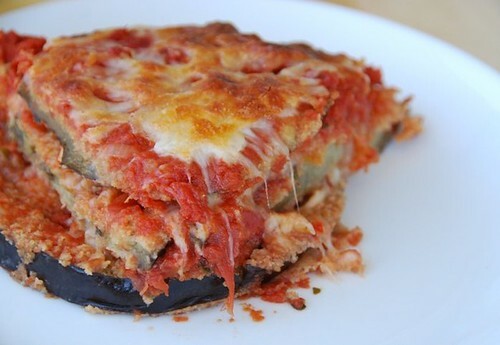 I LOVE eggplant parm and can't wait to try your version! Yum! I just made eggplant parm last week and I would have to agree, it is definitely a year round food. Grilling the eggplant is fantastic variation for the summer. Love your blog! I've heard of this on American TV programmes before but I never really knew what it was. In my imagination, though, it looked exactly like your picture! Luscious. Can't wait to try it. Ohhh, this is my favorite way to eat eggplant. Looks delicious! I love the baked version of eggplant parm. The country is melting, but we will still turn on our oven. Sweating is worth it! This recipe is a winner, Susan! Love eggplants...will definitely try this one...looks really yummie! I love eggplant parm -- it's such a Rhode Island favorite -- but I'll have to wait until it's a bit less of a steambath here. Can't bear the thought of turning on the oven! always a favorite at our home. aubergine tomatoe and cheese almost nothing could make me a happier girl! I adore a good aubergine parmigiani! Yours looks very tasty! love your eggplant parma - it would go down a treat in melbourne's winter right now - so don't worry about the others who are sweltering - some of us after after winter warmers! I am a huge eggplant fan. I posted a grilled eggplant recipe today too. Your dish looks mouthwatering, even in this heat! Wonderful recipe susan, baked eggplants are one of my fav..yummy! That looks insanely delicious! I'm making that tonight! So going to make this. Surprisingly, my 4 year old likes eggplant and this will be a good way to prepare it for him. Yes I love eggplant parm but could do without the frying, but it does taste better fried! I too bake the eggplant. Recently I have been using Panko bread crumbs and they add a nice crunch to the dish. I'm just getting a bunch of eggplant from the farm, so this looks like a winner! That looks really good! I was hoping for garden eggplant to make something like this, but the tomatoes crowded it out. I'll try again next year. I bet if you covered compost with cheese even that would taste good. My favorite recent eggplant dish comes from Monica Bhide's book Modern Spice. It's pan-fried eggplant drizzled with a honey-ginger glaze. Spectacular. soma-It's one of my faves too! veron-Ah, a girl after my own heart. lisa-Your chicken parm looks wonderful! sal-Ha! That made me chuckle. snooky-I'm sure yours is wonderful too. kara-I feel your pain. I used to live in NC. Thanks! That's awfully sweet of you. gigi-I adore grilled eggplant. It really brings out the flavor. wendy-It tastes even better! Hope you try it. andrea-It's my favorite too. So delicious and comforting. foodhunter-Low fat but still delicious. duodishes-That's what I like to hear! anh-I'm glad you like it! lydia-I grew up with it. parita-It's so easy to love! southern girl-Yay! Let me know how it turns out! lisa-Really? That's wonderful! Thanks so much for letting me know. joey-That's just it. Some foods are worth suffering for. lucia-I agree. Fried eggplant is amazing, but sometimes I just don't need the extra calories. aparna-Oh, this should help keep you toasty then. I just made (and posted about) this a few nights ago. LOVED IT! It's so flavorful in spite of the simplicity of the recipe. Thanks so much for the recipe - definitely a keeper. xiaolu-I just saw it, and it's mouth-watering! Thanks for the post, my dear. I appreciate it! I love the simplicity of this so much that I linked to it over at goodfoodstories.com. Bet you never thought this would make great camping food?! danielle-Thanks for the link! I'll be right over to check it out! Other than that, it looks delicious! yivinns-Well, it depends on the size of the eggplant. And every oven's temp is different, so you just have to check it. But thanks for letting me know. It's always helpful to receive feedback about recipes! Love your recipes...am italian...dont you drizzle some oil on the dipped eggplant before you bake it?? It seems it would be soo dry....this is before the mozzarelle...and sauce...i drizzle oil on it after dipping in egg and breadcrumbs....and 400 deg to bake it afterwards seems too hot...thank you for all the recipes. anonymous-Actually, I don't drizzle it with oil. It comes really crispy on the outside and tender on the inside. But a little more olive oil never hurt anyone. ;) Thanks for the note. Someone gave me a huge basket of fruits and vegetables yesterday as a present. It includes 2 enormous eggplants that I will attempt to bake into this recipe. I got all excited when I thought I saw an actual egg as a topping on the picture! I will go ahead and be crazy and add one a few minutes before the end. melanie-A huge egg on top? Let me know how that turns out! I love an egg on top of a burger but haven't tried it on eggplant. Adding some ground beef between the layers this time just for a change. Looking forward to the end result! I'm taking this as a sign! I've been craving eggplant parm, but also dreading it since I know I need to get back up to par with my Weight Watchers. Low and behold, while reading an interview with your husband on one of my favorite blogs, FutureDerm, I see him mention your blog & cook books. And here you are, with exactly what I've been looking for! I'm making this very soon! Don't you just love Eggplant? If I'm in a hurry and short on eggs from the store I use my powdered eggs instead. 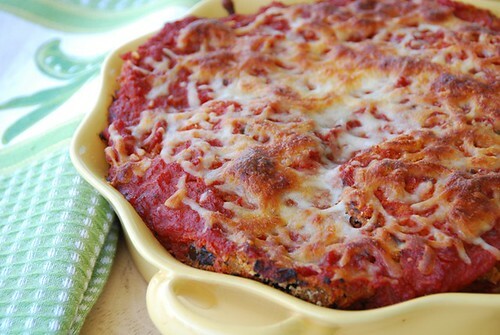 Here's my recipe...http://www.thrivequickdish.com/2012/02/16/eggplant-parmigiana/ Thanks!